Good morning everybody! I hope you have a wonderful week. How was your weekend? I enjoyed some very special time with my lovely sister and beautiful bride-to-be, then found myself gazing into the windows of Proud Chelsea, where The Audrey Collection by Bob Willoughby is currently exhibited. 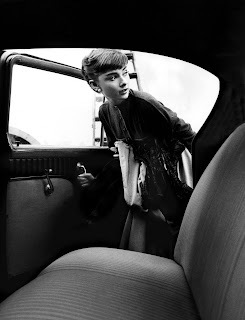 Audrey Hepburn gets into the studio car at Paramount Studios, 1953. Perhaps it's what distinguishes silver-screen superstars, but Audrey Hepburn's ability to captivate the camera during and post-filming, never fails to delight and fascinate. It's certainly difficult to imagine that Breakfast at Tiffany's would be named the most stylish film of all time, were it not for it's most supremely stylish of stars. 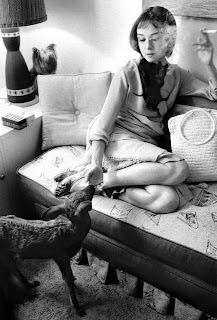 For Audrey's chemistry with the camera, is matched only by her affinity with fashion. It may have started with Givenchy's little black dress, but Ms. Hepburn's ability to transform any outfit (she was dressed by Monsieur Hubert for nearly 40 years), cemented her 'style icon' status. Audrey was also aware of the power of clothes in telling her story, both on and off-screen. Needless to say, she was also extremely beautiful. The Audrey Collection by Bob Willoughby, interweaves striking portraits of the movie-star on set, with enchanting shots of Audrey's everyday existence. As a trusted friend, Willoughby could capture candid moments from Audrey Hepburn's extraordinary life, and the (naturally) stylish photographs masterfully combine observation and intimacy. At the same time, costumes and 'off-duty' clothing enhance and shape the narrative. This exhibition is a real treat (and free of charge) for fans of film, fashion and especially, of Audrey Hepburn herself. I hope you enjoy it. Audrey Hepburn is definitely one of the most enduring style icons. I think she was the ONLY reason Breakfast at Tiffany's is so well-known. I thought it was a laughably terrible movie but she is so luminescent that she rose above the material to make it seem so much better than it was. She looks amazing, she was a true vision. 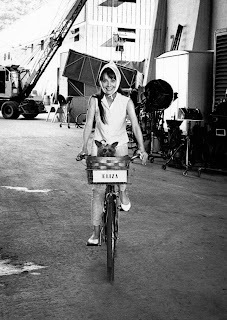 Audrey Hepburn is my absolute faaaaavorite!!!!!!! I've loved her ever since I was itty bitty. It used to be so hard to find her movies and such and now I see her everywhere!! Audrey Hepburn is the epitome of a lady. She is just beautiful, and her style is so classic and inspiring! I wish I were nearby to check out the exhibit. Audrey will always be a big big icon! No doubt of that.